On a cold and raw Boston day in April 1978, the Red Sox hosted Cleveland in an early-season matchup of American League rivals. It was much too early for the game to have any bearing on the Eastern Division, as teams were still bunched together in the standings with only a handful of games separating the division leaders from the cellar dwellers. 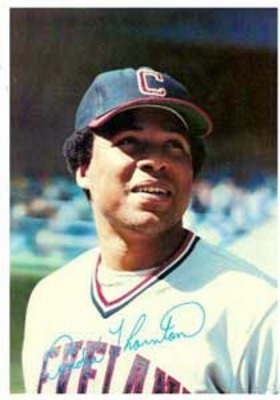 But this day belonged to the Indians, and specifically first baseman Andre Thornton. The Indians were leading 13-1 in the top of the eighth inning, courtesy of six runs in the frame, when Thornton stepped to the plate. There was no pressure on the Tribe slugger as he knocked a double off the left field wall at Fenway Park. It capped a big day for Andre, who went 4 for 5 with the double being the last piece to complete the cycle. Thornton hit a single in the first, a triple in the second, and a home run in the seventh inning. He was the sixth player to accomplish the deed in the 78-year history of the Indians. Andre Thornton was born August 13, 1949, in Tuskegee, Alabama. He was one of seven children (three brothers and three sisters) born to Mr. and Mrs. Harold Thornton. In 1955 the Thornton family moved to Phoenixville, Pennsylvania, located 28 miles northwest of Philadelphia. Harold thought that moving north would provide more of an opportunity to provide for his family and leave behind the racial strife in Alabama. He found work as a machinist while Andre’s mother cleaned homes. Andre starred in football, basketball and baseball at Phoenixville High School, but he also had a love for pool. Beginning at the age of 12, he played games for a few dollars, with the pot growing into the hundreds by the time he was in high school. He began his ascent to the major leagues at Huron, South Dakota of the Northern League. “Going from Philadelphia to South Dakota was a culture shock,” said Thornton. “There weren’t any blacks in Huron except on the baseball team. I lived in a house with five players. We rented it and slept in the basement. One of my roommates was Toby Harrah.” Thornton and Harrah were the only players on that Huron team to make a successful climb to the major leagues, and later became teammates in Cleveland. Thornton married the former Gertrude Thomas in October 1970. The couple had two children, son Andre Jr., and daughter Theresa. Thornton spent the next six years in the minors, during which he was traded from Philadelphia to Atlanta. Even though he was starting to show some power with 46 homers over the 1971 and 1972 seasons, the Braves shipped him to the Cubs for Joe Pepitone. He was called up to the North Side, making his major league debut on July 28, 1973, against the Cardinals. He played sparingly over the last two months of the season, but never returned to the bushes. Nicknamed “Thunder” for his meteoric blasts, Thornton was named National League Player of the Month in September 1975 when he hit .321 and clubbed eight of his team-leading 18 home runs. Andre also drove in 60 runs and hit 21 doubles for the year. With Bill Madlock replacing Ron Santo at third base, it appeared the Cubs were set at the corner positions for years to come. But that idea was washed away when Thornton was dealt to Montreal on May 17, 1976. The Cubs received pitcher Steve Renko and first baseman-outfielder Larry Bittner in the trade. Thornton had gotten off to a slow start for the Cubs and eventually lost his spot in the starting lineup. Combined with Chicago’s need for a starting pitcher, the front office pulled the trigger on the deal. Six years later, Thornton wrote about his faith in God and the challenges he faced in the aftermath of the fatal accident. The book, Triumph Born of Tragedy, was a best seller in Cleveland. Although many books by baseball stars are high on bestseller lists because of gossip and inside dirt, Thornton’s book barely mentions baseball at all, Thornton choosing instead to focus on his religious beliefs. Thornton remarried after the season when he exchanged “I dos” with the former Gail Ellen Jones of Chicago. Andre met her through her father Dr. Howard Jones, an associate evangelist with the Billy Graham Evangelist Association. They had two sons together, Dean and Jonathon. The next two years Thornton saw very little action on the ball diamond. After he injured his right knee during a spring training game in 1980, surgery was performed on the knee, but it did not heal correctly. The front office did not believe that he was pushing himself to return to playing condition. When he told them the knee was not healing properly, the front office did not buy it. It was discovered that a second surgery was needed to remove damaged cartilage, but the season was lost for Andre. The following year featured an extended players strike, resulting in the cancellation of 713 games or 38% of the major league schedule in 1981. Even so, Thornton suffered a broken hand from a pitched ball in spring training, which further derailed his comeback attempt. When he did return to the team, his primary role changed to that of designated hitter. Cleveland had obtained Mike Hargrove from the San Diego Padres for outfielder Paul Dade in 1979. Hargrove had fallen on hard times, first in Texas and then in San Diego. The former Rookie of the Year winner revitalized his career in Cleveland, taking over the duties at first base in 1980 after Thornton went down in spring training. Although Hargrove was a good fielder and a better then average hitter, he lacked Thornton’s power. After his power slumped a bit in 1983, Thornton’s 33 round trippers in 1984 were the most by a DH, he was named by The Sporting News to the American League Silver Slugger Team. He made his second appearance in the Midsummer Classic, collecting a single in the third inning at Candlestick Park. Like many players who spent a majority of their playing days in Cleveland from the 1960s through the 1980s, the postseason was just a dream. The reality was more disturbing, playing to small crowds in cavernous Cleveland Stadium. In Andre’s 11 years wearing an Indians uniform, the team finished over .500 just three times, and two of those were by a single game. In retirement, Thornton owned a chain of Applebee’s restaurants as well as his own sports marketing firm. He currently (late 2011) is the CEO and chairman of ASW Global, a supply chain management company based in Mogadore, Ohio. He is also in demand on the public speaking circuit at churches and various organizations. Andre Thornton may have been a power hitter, a strong performer on the baseball diamond. But it was his inner strength that enabled him to overcome personal tragedy in his life. It was from this fortitude that family, friends, and teammates found strength to shape their own lives. National Baseball Hall of Fame, Andre Thornton’s file. George Vass, “The Game I’ll Never Forget,” Baseball Digest (August 1986) 79. Terry Pluto, “Andre Thornton: Saying What Needs to be Said,” The Cleveland Plain Dealer Magazine (July 4, 1982) 6-10. Jerome Holtzman, “Thornton Geared for Big Year in 1975,” The Sporting News (October 5, 1974) 18. Russell Schneider, “Indians New Balance Excites Robby,” The Sporting News (January 1, 1977) 34. Tom Mortenson, “Former Tribe Slugger Andre Thornton: Always a Class Act,” Sports Collectors Digest (February 11, 1994), 14-17. Rick Telander, “Thunder, But No Gray Skies,” Sports Illustrated, (August 2, 1982), 46-48. Bob Nold, Thornton Demonstrating All-Around Ability,” Akron Beacon Journal, 1978. Terry Pluto, The Curse of Rocky Colavito, (New York: Simon and Schuster, 1994), 244. Mike Peticca, “Thunder Will Reign in Indians’ Hall,” The Cleveland Plain Dealer (August 9, 2007), D3. Terry Pluto, “2 Knees are Important to Tribe,” The Cleveland Plain Dealer (February 9, 1981), 1C, 4C. Terry Pluto, “Thornton Bears Up Under Heavy Burden,” The Sporting News (December 20, 1982), 48. Sheldon Ocker, “Idle Indian Thornton Retires”, The Sporting News (December 14, 1987) 56. Mike Peticca, “Thunder Will Reign in Indians’ Hall.” The Cleveland Plain Dealer (August 9, 2007) D3. Joe Fitzgerald, “Born Again: The Incredible Comeback Story of Andre Thornton,” Baseball Magazine (August 1979) 50, 58.